Beck posted a six-minute video clip on his website this week in which he recounted a conversation he said he had with Gibson. He said Gibson spoke of his religious film being “stolen” by “Jewish people” and that the backlash caused him to lose friends — and that strangers got downright nasty. A rep for Gibson did not immediately respond to a request for comment. Both the clip and Beck’s narrative have since been removed. They have been replaced with an editor’s note saying the material “inadvertently revealed details of an off-the-record conversation.” But the Daily Beast easily found the original post with Google Cache. Although the 2004 film about the final days of Jesus and his crucifixion earned $612 million worldwide, it drew questions of historical and biblical accuracy and allegations of anti-Semitism. 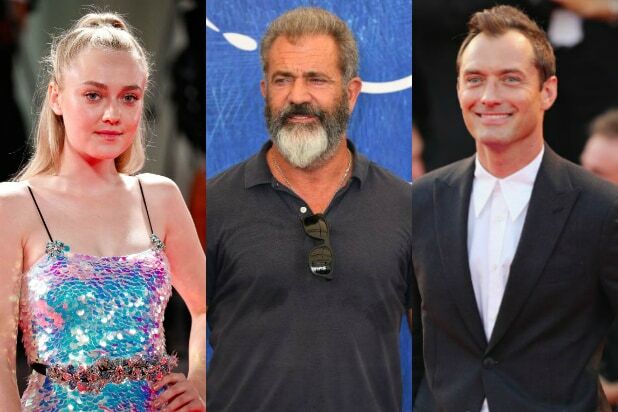 Gibson’s new film, “Hacksaw Ridge,” was well received at the Venice Film Festival just a few days ago. Click through to see the stars at this year's Venice Film Festival in Italy. Director Mel Gibson and his lead "Hacksaw Ridge" actor Andrew Garfield attend a photocall for the film. Jude Law, who stars in "The Young Pope," walks the red carpet of the film's premiere. In iridescent sequins, Dakota Fanning appears at the premiere for "Brimstone" at Sala Grande. James Franco attends the premiere of "In Dubious Battle," in which he starred and directed. "In Dubious Battle" star Ashley Greene attends the film's premiere. Socialite Hofit Golan also attends the premiere of "In Dubious Battle." (Left to right): Dayane Mello, Matteo Manzini and Giulia Salemi attend the premiere of "The Young Pope." Sarah Yimo Li attends the premiere of "The Distinguished Citizen" at Sala Grande. Another look at Dakota Fanning's stunning dress during the premiere for "Brimstone." Director John Landis attends the photocall of "An American Werewolf in London." Vince Vaughn, who plays Sergeant Howell in "Hacksaw Ridge," attends a photocall for the film. "The Young Pope" star Gemma Arterton attends the film's premiere on Saturday in Venice, Italy. A pregnant Teresa Palmer, who stars in "Hacksaw Ridge," poses during a photocall. Luke Bracey also appears in Mel Gibson's "Hacksaw Ridge," seen here during Sunday's photocall in Venice, Italy. Andrew Garfield attends the "Hacksaw Ridge" photocall in Venice on Sunday. Mel Gibson poses in Venice, Italy, on Sunday for the "Hacksaw Ridge" photocall.